Learn, grow, evolve. Not only a good life outlook, but one which pertains to the artist’s work as well. If you are not learning, you are dying – and so is your work. Most artists can take a retrospective of their careers, or lack there of, in art and watch the evolution of style, design, knowledge, skill and experience. I take a look at my work from university days – when academic values held sway, and have a mixed bag of feelings. There are times when I become nostalgic, but most times I just roll my eyes and thank the Source I have grown as both artist and in-the-trenches professional. This growth seems to me to come on several levels. There are also the times to take stock and perspective of your work and career. Of the national average, 8% of artists make their living from their work. That’s paying your bills, putting ramen on your table, buying materials and patching the leaky studio roof. I’m thankful to live in a town where the average is 12% yet we have had to fight for every single %. This takes evolution of community participation as an artist as well. Enjoy selling your art at an Art in the Park? I am willing to bet that event has had to fight to get where they are. Feel honored to show your work in a gallery? That gallery has fought tooth and nail to maintain not only community support but the support of local City Councils and possibly State designations and funding for the Arts. Take another look at my home town. We enjoy a 4% higher average than the nation of artists making their living with their art, and is consistently voted one of the Nation’s Top 10 Best Little Art Towns and yet to get here we have to fight such things as City Council members being quoted as saying “We’re gonna get rid of those damned artists” – and worse. So if you enjoy success, or hope to, get involved in your local community. Go to City Council meetings and make sure they know the art community is bringing in tax base – through sales of your work and from bringing in patrons to town who not only buy your work but go to dinner while in town, buy gas and sleep in hotels. Encourage them to take a look at funding sources as well – State and Federal monies are out there through grants and tax breaks for designated art areas and communities. And remind them that the Arts have a PROVEN track record for increasing school grades (more outside funding for cities), improving self esteem (less funding needed for social programs) and health (tax base directly from the Arts). Run for office and vote out those people who don’t support the Arts. 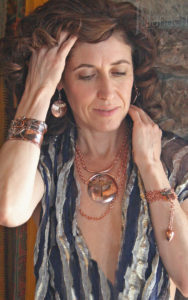 I make my living from a line of recycled jewelry. Do the designs and works make it into fine galleries and museums? No, of course not. However, they do make it into galleries, gift stores and museum gift stores This pays the bills with my work and I am therefore very unapologetic. This allows me to have the resources to then focus and concentrate on those pieces which DO make it into high-end galleries, museums, shows and private collections. But all this takes growth and evolution which involves experience, exploration and learning. My techniques and skills have evolved but so has my style. These are important aspects of who I am, and my successes as an artist. My recent explorations into the Bohemian concepts have taken me in a whole different direction than what my main style would suggest. This not only gives me a different perspective and experience base from which to work, it keeps my mind nimble and allows me to add new concepts, techniques and patronage to the synergy of my repertoire. And yet an even more exciting aspect is that going off on a seemingly tangential course has freed my Awen from a previous brick wall blocking my success with another design concept altogether. Weee! Explore, even if it means in a direction you thought you would never take. Mentor emerging artists, which often solidifies knowledge and experiences of your own and allows you to move on from a stale and stodgy design existence. Become active. It’s easy to be that reclusive, introverted artist-type but your work and your sales are dependent on a healthy community of support for the Arts. Evolution as an artist takes thoughtful, purposeful activity.